Give yourself a mini vacation in the middle of your hectic life simply by adding a little paper umbrella to an ice cold drink. Not only do they transport you back to the beach for a minute or two, they'll also liven up decorations for any party. They are so easy to make that you can easily match the color or theme you want just by choosing the perfect paper. Turn the drinking glass upside down on the paper and cut out a circle. Fold the circle in half to make a semicircle. Fold the semicircle in half again so that you have a triangle. Fold that triangle twice more. Unfold: You should see 16 sections. Recrease each fold so that all the folds bend outward, like an umbrella. Cut away one of the sections, then use the glue stick to overlap the edges and glue the circle closed, creating a cone shape. Let dry. Trim several toothpicks to be a little bit longer that the radius of the umbrella. Then glue them along each crease. 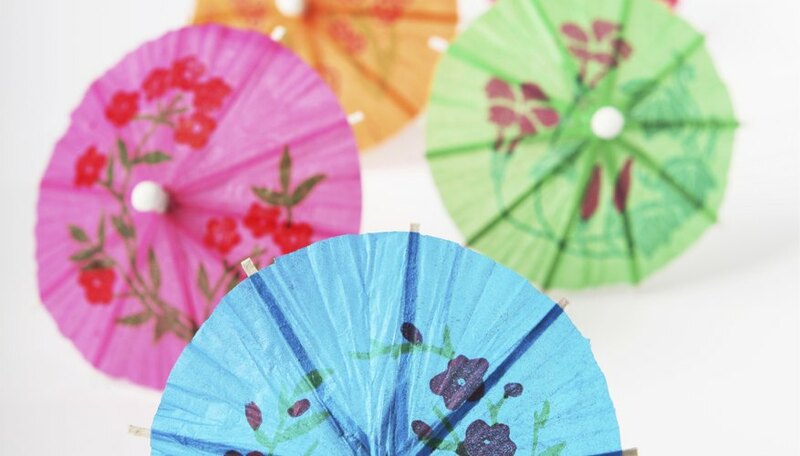 Cut the skewer to the desired length and glue it to the center of the underside of the umbrella. The tip of the skewer should slightly poke through the top of the cone. Stick the bottom of the skewer into a piece of florist's foam so your umbrella can stand upright until it dries completely. The thicker the paper, the sturdier your umbrella will be. Cut the skewers and toothpicks carefully and watch out for splinters. Elise Jimenez discovered a love of creating at a very young age while working on craft projects with her grandmother. Armed with a degree in creative writing, she spends half of her time working on her YA novel while devoting the other half to her own handmade craft business, Geekilicious.